LOL...I don't know where you live, but people in this country are arrested, indicted and convicted for fraud ALL THE TIME. Probably every day. What makes you think CM will be any different? So what law enforcement agency(s) do I file for criminal grand theft? If they knowing stole money and/or property from us why are they not being arrested and prosecuted for criminal grand theft? Maybe the corporation is protected by bankruptcy because it is considered the 'individual' relative to creditors (Yes, the US Supreme Court ruled corporations are people) but the "decisions and actions" of the human individual that lead to the bankruptcy should be prosecuted a criminal with potential jail time. Consider if I decided that I could make a corporation to blame for my criminal activities; I form a corporation, rob a banks vault, when caught claim only the corporation is liable for the assets taken in the robbery; I am not responsible under criminal law because I used the corporation as the responsible "individual" under the law and I am shielded from any criminal prosecution as a result. I think not! If true then every thief in America should file articles of incorporation before robbing a bank, convenience store, or your home! Seriously though, can I file a grand theft report with law enforcement? If so how and where? If they knowing stole money and/or property from us why are they not being arrested and prosecuted for criminal grand theft? Have you ever been to an emergency room and had to wait an hour or two? Perhaps your child has a dangerously high fever, your doctor told you that you must go to the ER -- you're not some joker with a cough trying to save a buck by going to the ER. You've got a real emergency. Just like ER's do not work like they do on TV, arrests do not either. With an armed robbery, there is an immediate chance that people will be injured if the individual is not taken into custody. How much damage can Charles do with a new scheme in the months that the active FBI and other investigations take -- especially while he is being closely watched? Now if he wants to he could go out and, for example, spend $100,000 on a brand new sports car (if he can come up with the money). None of the creditors has filed an injunction against him (the last time I checked), so he can do that (unlike in the Tulving case, where that did happen). But that's not what you want investigators seeing while you are under criminal investigation. The FBI has an active investigation going, so that would be one option. Another would be your local police department. I think what some well meaning folks on this forum don't realize, is that America is turning into a white collar crime nation. They advertised Gold for 0% over cost ... anyone remember those ads? but what do i know ??? According to the BBB posting, Discount Gold Brokers was ordered to Desist and Refrain from taking orders back in April of 2013. As your article pointed out, it wasn't until a year later, April 15 2014, that Berman was arrested. The clock is still ticking on CM. I don't believe that is the same company as the one advertising on TV -- that appears to be a small-time guy (it shows him as having 41 victims). Not that it really matters how many people he scammed. In his case, the State of California issued him a Cease and Desist order on April 15, 2013. He plead guilty in May, 2014. That's over a year, and comparable to Tulving (who agreed to plea guilty a bit over a year after shutting down). I'm not going to do anything to him..Except maybe flood the Opelika/Montgomery area newspapers with "hot tip" emails about a fraudster. Anyone want to help? 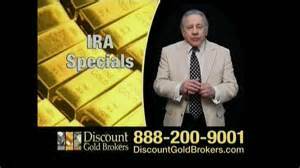 Ah, I guess I was wrong about the Discount Gold Brokers thing -- I thought there were two separate companies. My bad, as the kids say! Tulving shut down in March, 2014 -- so a bit over a year and a half. The sentencing will be in about 6 months to a year, at which point we will find out what happens. I will agree that when it comes to justice with bullion dealers, it seems very hit-or-miss. But I doubt that this one will be a miss (in that I believe there will be a decent investigation, resulting in punishment of those that deserve it according to the law). The FBI is actively investigating, and the U.S. Attorney's office is investigating as well. And Charles does have 2 criminal attorneys, so he clearly is expecting (or at least preparing for) justice to come his way. but do you really understand how dirty this metals business is? Have you noticed that while virtually every single mining company is publically traded, NONE of the resellers are on the DOW? I have ... there is a reason ... a lot of it has to do with "storage"
I wonder if motive isn't a big factor in determining whether these perpetrators of ponzi-like business schemes are severely punished or not? In the case of Berman, I heard that he was funneling money to overseas personal bank accounts. If it turns out that CM just burned through money to fund his flailing businesses but that he didn't take enormous amounts for personal profit, might he not get off as being just a inept businessman? The net loses to all his customers doesn't change (regardless of his motive) but I wonder if he might be protected or at least not wholeheartedly prosecuted as long as he didn't get rich from his asset-obliterating scheme? PS: I'm not saying that CM didn't take money and move it or hide it. I'm just saying that if they can't determine that he did take money and use it for anything other than his businesses. In other words, I think the investigators have to find where the money went before they can prosecute him.